Yes! I am beginning to like my face too and even one of my favorite pictures of late was one of me without makeup. I think we have it twisted in our heads about the truth. Love, love, love that you are documenting this. Encouraged to hear your progress! Keep at it! Way to go on your journey Melissa. That’s the truth when we aren’t focused on feeding our faces with things that we have time for other things. I am happy to hear that you are coming around to being “naked” in the eyes of the world. I believe that when we are not worried about things that we are able to experience things which we otherwise would have missed out on. May I challenge you to look at yourself in the mirror each day and say to yourself one thing that you like about what you see? I prefer the no make up face. Well thank you. I can’t say I prefer it yet, but it’s growing on me. If worst comes to worse, make sure Mike has the name and number of a cosmetician you trust. Nothing like looking twenty years older, when you enter your final resting place. I swear, if I would have thought of it I would have held a mirror to my wife’s face. Would have woke the dead. I buried my dad with a pack of cigarettes and some matches. You might want to give some thought to packing some extra mascara, and foundation. Come the resurrection, I’m sure there will be plenty of women looking to bum some. After all they will want to look their best as they greet their loved ones. You can do it! I have lately entered a season of being (sort of) okay with not wearing makeup. I was sick of the notion that my beauty was conditional, that it was based on whether or not I was wearing makeup or cute clothes. Instead I have been letting God fill me with satisfaction about my appearance, and I feel so much better about myself knowing that he intended for me to look this way! Plus, people haven’t really said much whenever I don’t wear it. Sometimes I’ve even gotten compliments on my skin….insane. 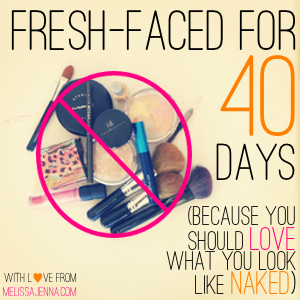 You are so beautiful without makeup- believe it!